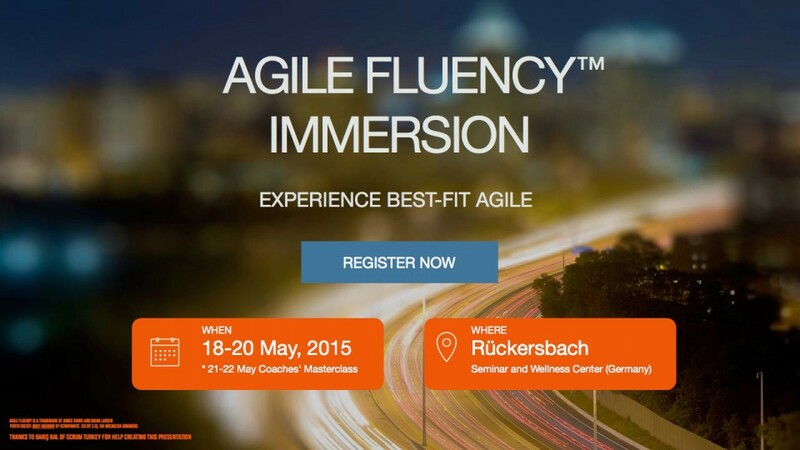 Agile Fluency™ Immersion — Discover Your Agile Pathway. In 2016, we are running small immersions at conferences such as XP2016 in Edinburgh and Agile 2016 in Gdansk. 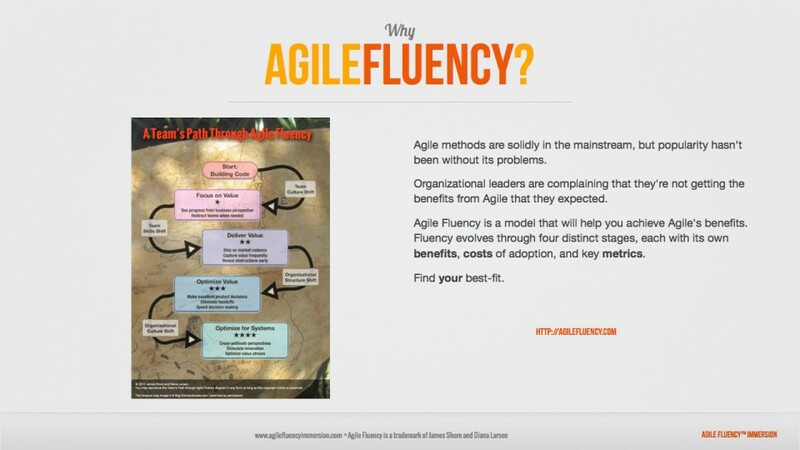 We’re also working with the Agile Fluency Project to produce Agile Fluency Gatherings. Look for a European Gathering in 2017! We offer immersions that range from 1-3 day basics, to the full 1 week bootcamp. You can deliver the best results. Are you passionate about getting the most possible value out of your investment in creating quality software applications? We will show you how. Have you received the results you want out of your software application development efforts? 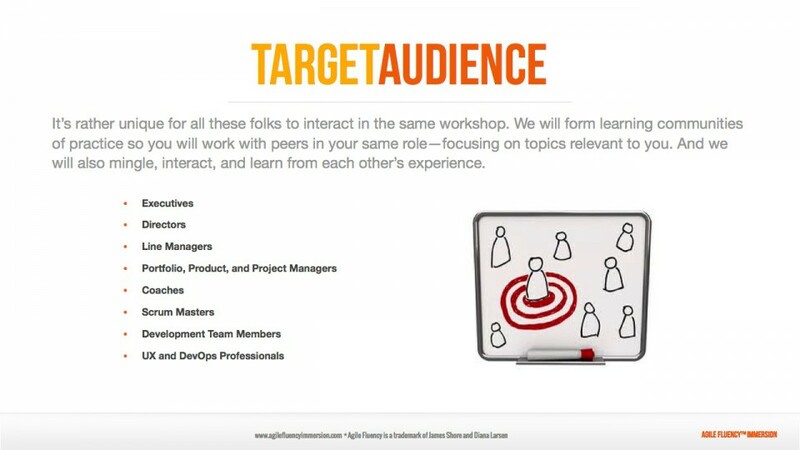 In this 3-day workshop, you will learn how you can get the rewards you need. 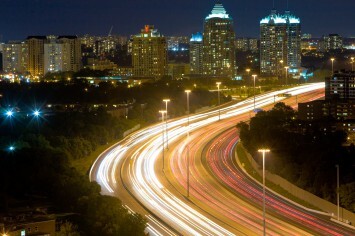 You’ll understand the roadmap for making the investments required, and you'll appreciate the benefits you're currently receiving. You'll acquire new skills essential to optimising the results of your software development organisation. 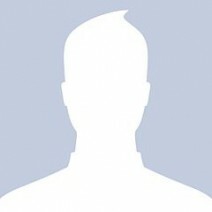 You will be ready to collect the rewards of your investment in developing software applications. This experience is for everyone who needs to deliver results. 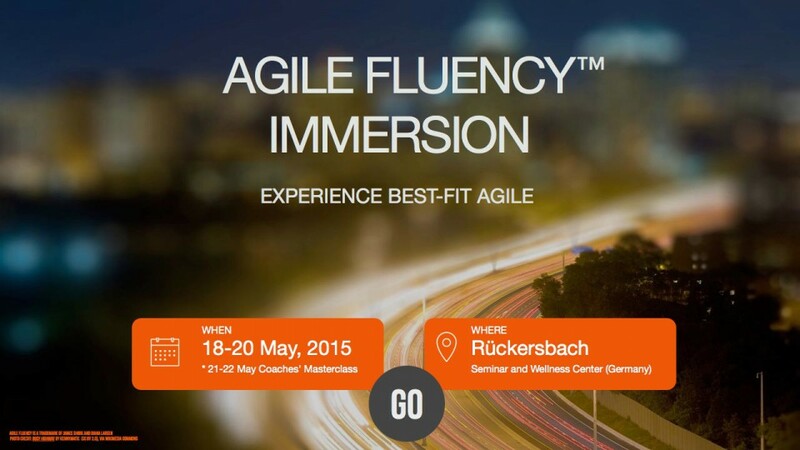 Diana Larsen and Steve Holyer invite you to join us for the Agile Fluency Immersion. 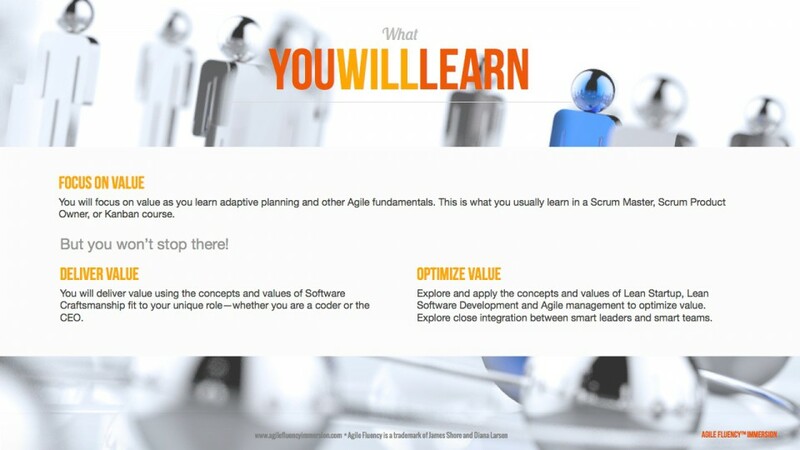 Kickstart your Agile transformation, and take it to the next level! To get the best deal, register today. The fee for the workshop includes your full stay (room and all meals) at the 4-star Rückersbach Seminar and Wellness Center near Frankfurt, Germany. The only additional fees you will incur are at your own discretion, e.g., for your bar tab or wellness activities. We are also working with coaches and facilitators who want to help teams reach their goals for Agile Software Development. 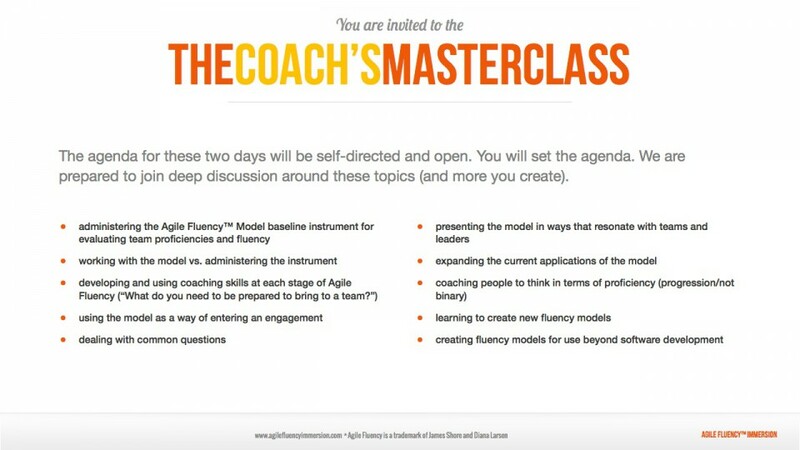 The coaches' masterclass (offered as a two day add-on to the Agile Fluency Immersion 22-22 May) is your chance to create an intentional coaching community of leaders and practitioners who help teams avoid the pitfalls that lead to what Martin Fowler calls “flaccid Agile”. Whether the title on your business card says "coach" or not, you are invited to join this group if you are passionate about helping teams reach their goals. We want to work with a small, dedicated, passionate group. We also want to encourage early registrations. That's why the first people to signup get the best deal. 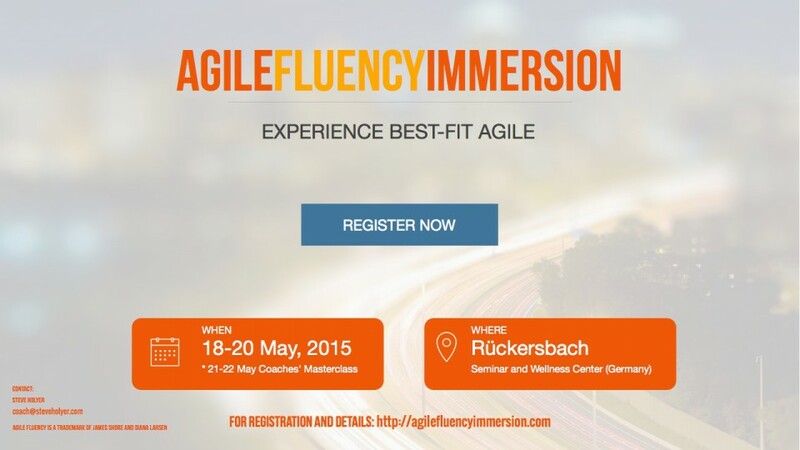 [event post_id="300"]#_BOOKINGFORM[/event] Contact workshops@agilefluencyimmersion.com if you have questions about registration. 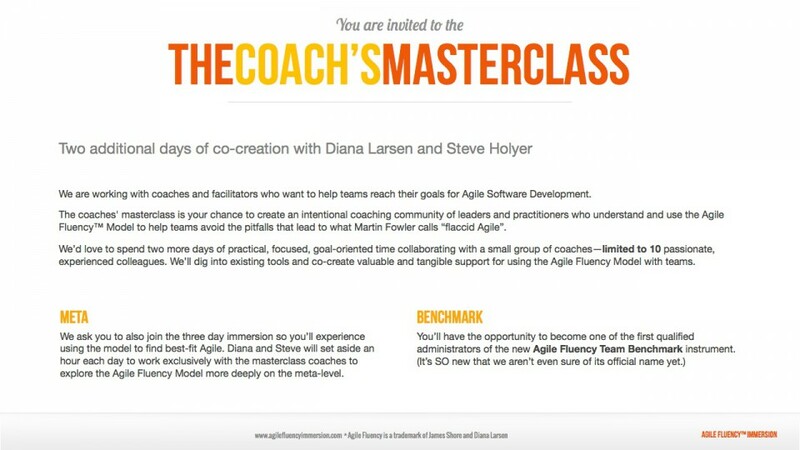 In the next month, we will be adding more information about the workshop, about the coaches' masterclass, and about the Agile Fluency Model. 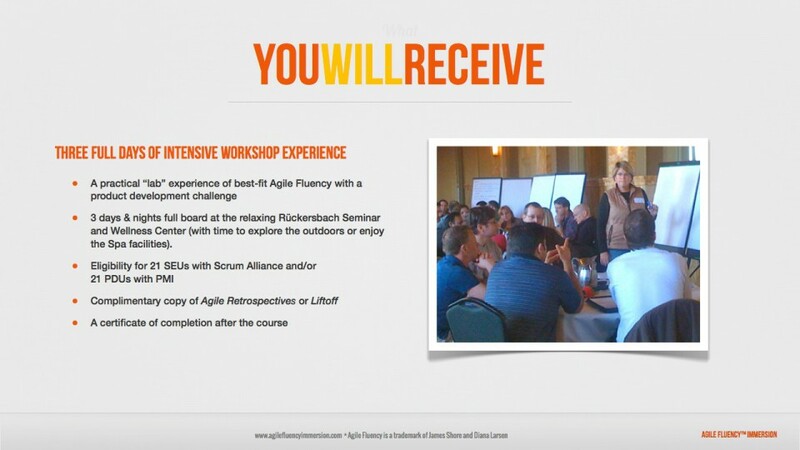 We will also use this mailing list to announce more Agile Fluency Immersion experiences. If you haven't decided to register yet, please signup to our mailing list. We'll send updates when we have news. 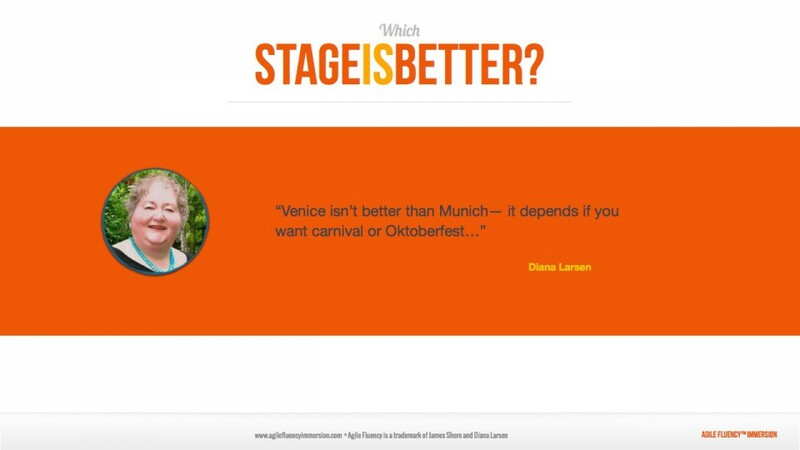 Johannesburg, October 21: Save the Date to “Unleash Your Value Proposition“ Our plans have reached the stage where I can finally tell you: I am flying solo to Johannesburg, South Africa to guide you through a one-day premium workshop for Agile leaders and coaches on applying the Agile Fluency Model!! I'm working with a partner in Johannesburg will open will open signups and make the official announcement in the next few days. For now, save the date Wednesday, October 21! 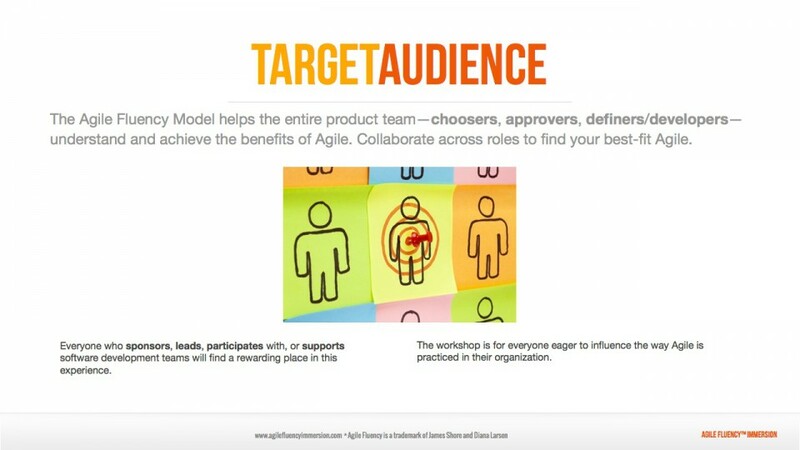 New Workshop: Unleash Your Value Proposition using the Agile Fluency™ Model Do you want to: ... (re)capture the spirit of a startup? 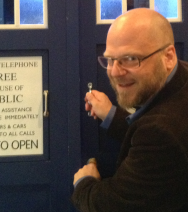 ... scale agile processes in a large organisation? ... meet the daily challenges of managing or coaching Agile transformations in a complex organisation? 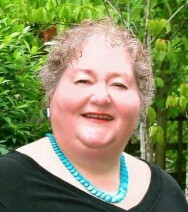 Then, save the date for this special 1-day advanced workshop! 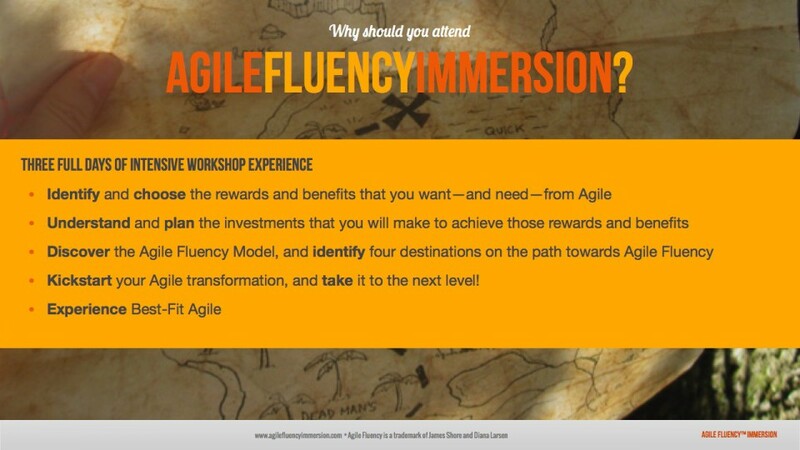 This is Why I’m So Excited About Agile Fluency Are you wondering how the Agile Fluency Immersion experience can help you in your work? 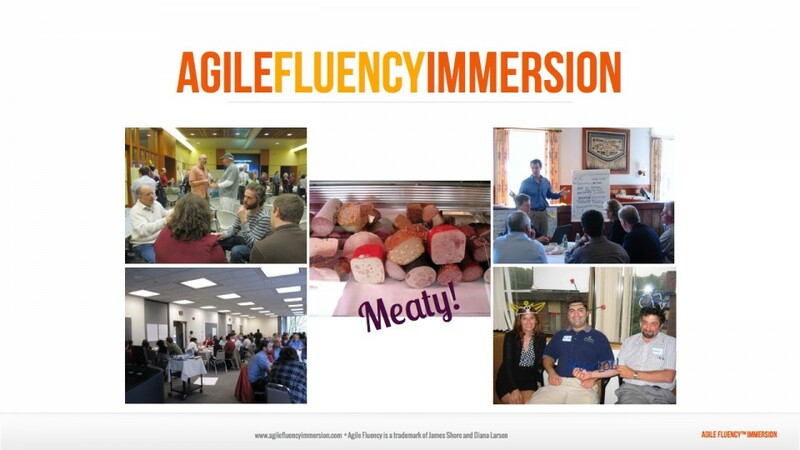 In this post, Steve writes about two of his experiences working with the Agile Fluency Model, and he describes what we want you to experience during the 3-days of the Agile Fluency Immersion. Signup for the latest news. Agile has a problem. When we started out with Agile Software Development, people did it because it made their products better. It also made their lives better. Because you got happy and motivated team members too. 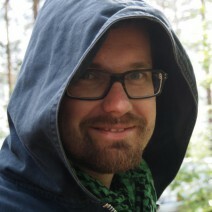 But now, in too many cases, it seems that Agile is failing to deliver on its promise. 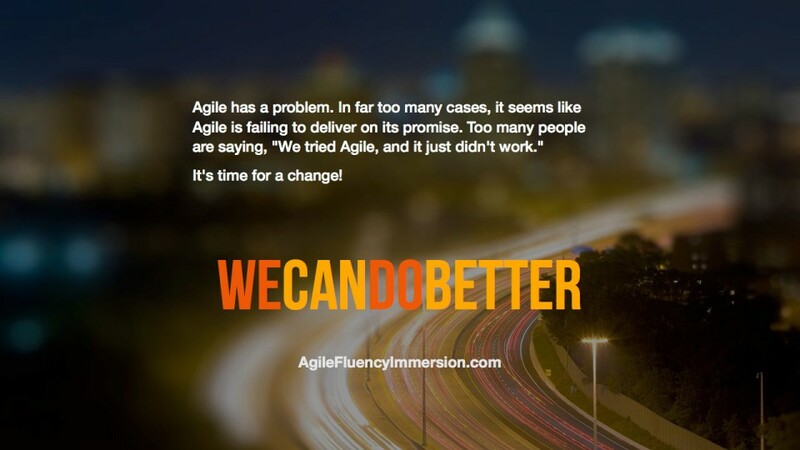 Too many people say, "We tried Agile, and it didn't work." We can do better! 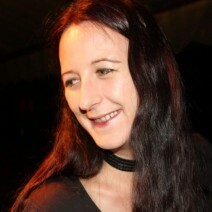 It's time for a change! 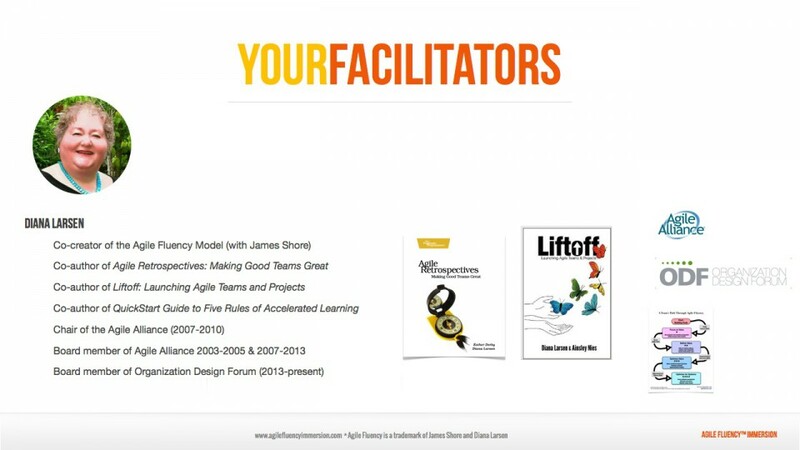 Agile Fluency is a trademark of James Shore and Diana Larsen.